The USBG3-3X4M is a 4 Port USB 3.0 Hub that complies with the Universal Serial Bus 3.0 (USB 3.0) Specifications Revision 1.0 and works up to 5Gbps. The design incorporates dual power conversion systems to operate to USB 3.0 maximum current for each port. Adds 4 USB 3.0 Super-Speed data ports with LED Status indicators. Uses Screw Lock cabling for secure connections. Backwards compatible with USB 2.0 / 1.1 devices. 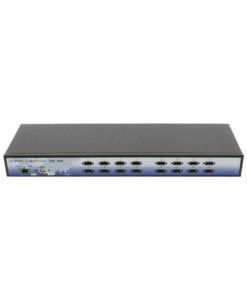 Provides a maximum of 900mA current to each port with dual power conversion. The USBG3-3X4M USB 3.0 4-Port Industrial hub with power supply provides 4 downstream facing ports with standard Type-A USB 3.0 connectors. 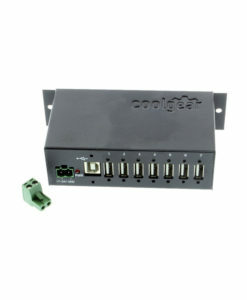 It supports screw-lock features for both upstream (USB type B) and downstream (USB type A) connectors with the screw-lock USB cables. The screw-lock features are a preventative measure against accidental disconnection from the USB cables and hub. With built-in single chip USB 3.0 controller, it is backward compatible either when any one of downstream port is connected to an USB 1.1 or USB 2.0 compliant device, or when the upstream port is connected to a USB 1.1 or USB 3.0 compliant host. The USBG-3X4M USB 3.0 4-Port Industrial hub design incorporates dual power conversion systems. This allows the hub to provide the USB 3.0 specification maximum of 900ma current on each port. There is no other USB 3.0 hub currently on the market that can provide this much power to all connected devices, simultaneously. I’ll start by saying that this is an expensive hub. However, I have purchased 3 of them and am contemplating a 4th. – It’s a heavy, all metal hub, with superb build quality. The build quality seriously cannot be matched. IMHO nothing comes close. – Has bus and self powered modes. I don’t worry about power in this thing at all with the external power, but it can also function passively. It’s well built and well ventilated. – If you look at the down ports, they have holes on each side of the port to screw in the USB cables. I don’t have any devices with these attachments, but this is serious industrial connection strength if you have the need. – And my personal favorite… it has mounting screw holes on the chassis. – It’s not really pretty. It’s industrial quality, but it’s also industrial looking. It’s great for mounting under a desk surface, leg, wall, or other not super conspicuous place. – It only has 4 down ports. Not a really big deal for me, as I have multiple hubs, but it can get pricey if you have several devices. I got these hubs with a new computer build that has USB 3.0 in a new home. I knew my setup would be very fixed for a long time, so I wanted a serious solution for the new USB 3.0 protocol (and backwards compatible connecting 2.0 devices of course). I mounted these under my desk and on the side of a hutch with some small screws. The hubs are quite immobile. I can plug/unplug devices at will and it won’t slide around at all. I never worry about pulling power, or yanking cables out for my more mobile accessories. The ones under my desk surface are perfect for printers, mice, microphones, keyboards, etc. the stuff that I never really unplug. I have ports to spare. The one on the side of the hutch is for the devices that I plug/unplug a lot like thumb drives, phone, tablet, cameras, etc. It looks fine, and is in area where I can arrange cable routing very conveniently. I highly recommend this hub if you need serious durability, performance, or you need to screw the hubs down to keep them from sliding all over the place. They’re not shiny, but not meant to be. They are a power-user’s hub. Great device, works reliably, built like a rock. This is a beautifully constructed hub. Metal case, screw tabs to allow for under desk mounting, overall a nice solid piece of hardware. Unfortunately I can’t say anything much more for it. There is some sort of hardware issue with this hub that causes my 2015 Mac Pro to constantly throw out alerts about too much power draw and then the computer promptly disconnects whatever devices I have plugged into it. In looking at the manual it seems that the manufacturer is aware of this! I’m not sure why they would ship a product with an issue like this. For being a $55 hub this is a little disappointing. I replaced it with a generic Amazon Basics USB 3.0 hub and I’ve had no issues since. I bought two of these. One for the front of my PC desk and one for the rear. I connected Power supplies which provide full power to each port. You will not get this if you don’t connect it. I get full power, full speed and no issues on my WIn8.1 custom built PC with 3.0 USB ports. I don’t understand the other comments unless users are not hooking to USB PC ports and not using the power supply. The supply needs to deliver 1 amp per port for it to supply voltage to non-powered USB devices. This product seems to be well constructed but it does not comply with the USB 3.0 specifications, the ports provide about 450 mA when they are supposed to provide twice as that, 900 mA. Also it strangely shows as a USB 2.0 hub in the hardware profile provided by my computer. After doing extensive research on a hub that would be capable of handing my USB 3 along with my legacy devices I choose this device because I wanted a heavy duty hub that didnt move around. One that I could mount to my desk and work really well with all kinds of devices. It has a Transaction Translator Chip so slower devices do not cause the performance issues with faster devices which is a big issue for me with other USB hubs. Unfortunately I had a problem with a headset I tried to use with the CoolGear USB 3.0 4-Port Industrial Hub. The headset I use is a Plantronics GameCom 780 Surround Sound Stereo PC Gaming Headset. When I plug this headset into the USB hub the head set would work for a short time and and then It would just lose connectivity to the device from within my applications. It would still show up in the device manager but would not work in my applications. Basically passing it off to the manufacturer of the headset when the headset works fine on with USB directley attached to the computer. Obviously they didnt really do the work necessary to find out what was the cause of the problem. So I contact them by phone a tech answered and I started to explain my problem as I got half way though the conversation I didn’t get any feed back from him so I asked if he was still there. Got no reply on the other end just dead silence. Frustrated I contacted there sales department and explained the problem. He got right on it and said he would test the device and get back to me via email. A couple of days later I got an email stating the device is unsupported by the equipment and they offered to give me a refund. I feel like I didn’t get good customer support, and I did feel like they were not interested in handling my issue until I found someone higher up that was willing to deal with this problem. All though the last person I spoke to did his best to help me I feel like they could go much further and offer a reason to why its not working and what the plan on doing in the future to fix this problem so I could have at least have trust in the fact that they know what they are doing and plan on resolving it in the future in case there support issues were a fluke and I wanted to purchase any products from them in the future. At this point I cant recommend buying a product from this company simply because they don’t have there act together enough to handle support issues. There support department seems lax beyond belief. In the meantime I think I will still use it for my other devices or im going to do some research on another industrial product that is comparable. If any one has any recommendations please let me know. Purchased 2 of these for a critical install with a 2013 iMac 27 and a set of 4TB UASP Enabled External Drives/Enclosures. Dressed out of the way in 2 positions, a 3 to 1st port and 2 to 2nd port. The most important issue was not slowing down the new drives. Very few hubs have a quality power supply, B uplink connector, and rigid case. In my instance, the design of the case with it’s screw mounting was a huge plus. As another reviewer noted, it’s not pretty. This “Function Over Form” design was the very thing that attracted me to the product. The ground connector was not used in my installation, but it’s an interesting detail for those who would use it on or around metal. Upon inspection when it arrived I noticed something jiggling inside and there is a problem with the power supply connector. It’s loose. When you insert it in there is no feeling that it is secured, You can pull it out with no effort. I’m from South East Asia and returning it for a replacement is not a wise option as it will be very expensive. I decided to use it then. Despite my complaints it did function for awhile before it suddenly stopped working. Now I’m stuck with an expensive paperweight. Your experience might be different from mine though. Perfect hub for that tucked-away back corner, behind a bunch of drives where it’s hard to reach. This is a heavyweight, metal box that will stay put, making it easy to plug, unplug, and generally ignore. It’s heavy enough not to be shoved or pulled around by the weight of cables. (But then, it is also pretty industrial in appearance — not all light, sleek, and plastic like many. You probably won’t want to put it out on your desk where you will always be looking at it.) Unlike lighter and less expensive hubs I’ve tried, this one does not randomly disconnect or give any problems. I attached the thing the day it arrived (tucked away in the back of a shelf), connected four peripheral drives, and have not had to mess with it since. For the first time in years, all my remote peripherals are staying connected and I’m not getting any messages about how my devices could perform faster. Though it is more expensive than others, it is worth the price if your budget permits. I’ve gone through a massive number of hubs trying to find one that could power 2.5 drives and also charge an iDevice. This hub not only performs flawlessly, but it looks and feels like a quality piece of hardware. Obviously the price point is a factor, but other hubs are getting close to this cost without even touching this one on quality. If you are struggling to find a USB2/3 hub that will end your search, this is it. I have the little brother, 8 port USB 2.0 hub, which has been faithful and troublefree for over a year. I needed another hub and opted for the USB 3.0, since that is the new standard. The unit is just as solid and reliable as it USB 2.0 hub, but I find the lights on this unit annoying. I understand why they’re there, but when it’s sitting on your desktop as mine is, this is very distracting. A switch to disable the lights would have been nice. Other than that, it is a very solid, well made hub. I would buy again.